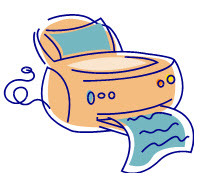 We used to point out that laser printers were cheaper in the long run because the ink was cheaper. Now some of the printers themselves are cheaper. Inkjets are still much of what you see when you go to an office supply store, especially the all-in-one (fax, copy, scan) units. These seem like a great idea, but we’ve found that the individual features of the all-in-one aren’t great. And what’s more they never have been; if you want a scanner, buy a scanner. But the all-in-ones are cheap. So we’ve bought models from HP, Epson and Canon, the major makers. How can you resist? As usual, we’ve been dissatisfied. We should ask ourselves over and over: why do they sell these things so cheap? Because they make tons of money on the ink, of course. But what about the print quality? The color is poor compared to the glossy magazine quality of a laser. But enough already. Having spent $388 to buy Canon’s top-of-the-line color inkjet – the “PIXMA PRO-100 Color Professional,” we junked it and went back to an Okidata color laser. What? Had we been snookered? So we had. It can happen to anyone. The salesman at our favorite big-box-store convinced us despite our natural skepticism that this Canon Pro was the best inkjet quality you could buy. Unfortunately, he didn’t have any sample printouts to show us. And so it goes. This top of the line turkey was two years old and had the worst color print quality we’d ever seen. They must have been delighted when they moved it out of the warehouse. To top it off, the initial set-up required an hour-long discussion with technical support. So we got our money back and bought an Okidata C331 laser printer for $316, $72 less than the Canon inkjet. We have bought this kind before and sure enough, the color was still gorgeous. It also prints duplex, which means it can print both sides of a sheet in one pass. This is important and you want to check for this when you buy a new laser printer. That’s because the powdered ink is melted to the page by a hot roller — 440 degrees in this case, hot enough to brown a roast. If you run that paper through a second time to print the other side, there’s a small chance the ink from the first pass will come off onto the hot roller. We’ve only had that happen once, but the repair cost is almost as much as a new printer. One last cautionary note: Laser printers tend to be heavy, especially color printers. Our Oki weighs 50 pounds. So you want to have a strong guy around when you take it out of the box.